I love 3-ply. | carpe diem! As a knitter I honestly never thought about the number of plies/strands in whatever I was knitting, except perhaps as a measure of thickness. Laceweight had two plies because two plies are thinner than three plies of a given thickness. Obvious, innit? Other yarns? I am slightly embarrassed to realise I never thought about it. 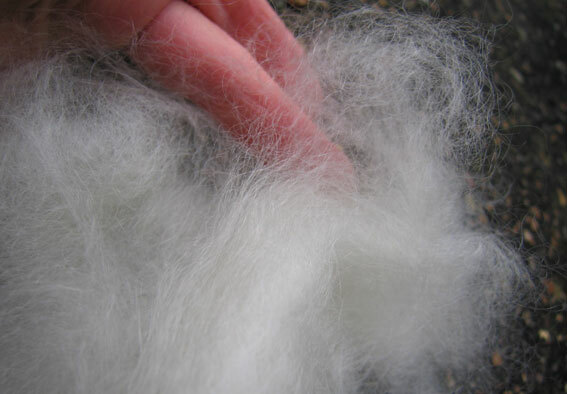 Colour, fibre, softness, weight, gauge, price? Of course. Structure? Why? Does it matter? Thanks to Ravelry and spinning, I know it can matter a lot, enough to make a major difference to a project. Laceweight is 2-ply not just because it’s thin, but because 2-ply is oval in cross-section. Add more plies, and the yarn gets rounder in cross-section, which means it fills in the holes in lace somewhat. Make it superwash and bouncy as well as round and I now realise why the shawl I started in Dream in Color Smooshy (a four-ply) was so… not right somehow that I frogged it. Three plies are stronger than two, too: for a given fibre/spinning technique, three plies will wear better. My first sock yarn was a 2-ply, and I knew the first time I put those socks on that it wasn’t right. Now I know 3-ply would have been rounder, bouncier, more elastic underfoot… and slower to develop holes. I think most spinners start with 2-ply because it’s obvious, easy and FAST. 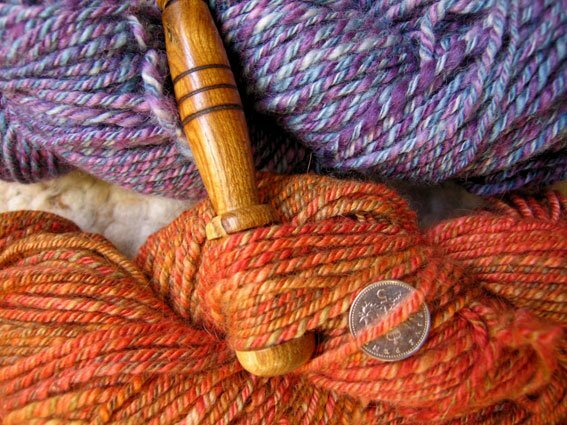 Two bobbins/spindles/whathaveyou and you can make Real Yarn! 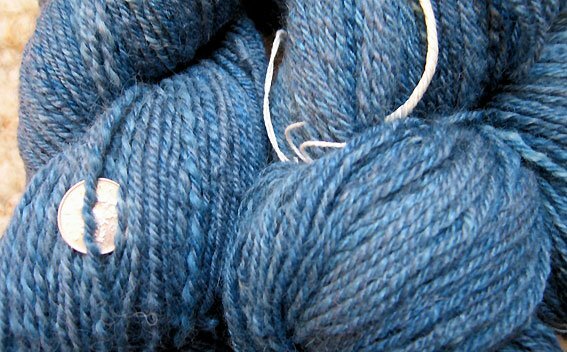 Quite a lot of my handspun to date was 2-ply for just those reasons. Then I was shown the wonder that is chain-plying aka Navajo-plying (it’s best to call it chain plying because it’s really not widely used by the Navajo weavers: they make small quantities for very specific purposes). I diligently chained myself to the wheel (ha! ), frantically trying to breathe as well as coordinate the hand movements. (I’ve since learned that many people chain a bobbin-full to add twist later). I didn’t like what I got. I knew the uneven twist and the indecently variable loop lengths would improve with practice, but the way that it emphasised unevennesses in the singles (it concentrates thickness as well as colour) was integral to the technique. And the little lumps at the start/end of each loop were unsightly. In discussions on Ravelry people have also pointed out that a chained 3-ply is just ONE singles looped back on itself. Any damage to that one singles means the yarn will lose its structural integrity. It can (apparently) unwork itself. Whereas a true 3-ply is THREE singles. Damage one of them and the other two can take the strain. More importantly for me, at any rate, true 3-ply nicely averages varying singles thicknesses instead of emphasising them, and breaks/blends colours more subtly than even a 2-ply. So I tried real 3-ply and fell in love. I can live with weighing my fibre into three lots, and the need to use three bobbins (in fact I bought extra bobbins just in case). That’s about 500m (my longest spinning project to date!! ), a wool/silk/alpaca blend that I think I bought from Fyberspates at Alexandra Palace 2? 3? years ago. It’s a bit wonky because I waited too long to spin it (I’ve learned the hard way that prepared fibres will settle/mat/gently adhere to each other as time passes), and I split it by fibre as well as weight: the alpaca did not draft as easily as the wool/silk, and it’s less elastic so it remains the same length where the wool/silk has bounced back to its original fibre lengths. Let me know if that makes no sense and I’ll try to explain it more clearly. My favourites, though, are those in the first photo. Top is superwash BFL from The Natural Dye Studio, spun within a month of purchase. Schacht, Scotch Tension. Below is a wool/silk/angora blend in Red Maple from The Woolen Rabbit that has been sitting in a box with other stuff ‘to be spun when I’m good enough’ since I bought it over 2 years ago. It too had compacted; the difficulty I had drafting it plus the fact that it’s my first double drive project means the singles were slightly overspun. I should, I really should have thought to run them back through the wheel to lose some twist but for some reason I didn’t think of it even as I muttered about the twist in the singles. So the final yarn is not quite as lofty and soft as I’d hoped. I’m telling myself that means it will wear well as a pair of fingerless mitts. That, my friends, is an ounce of Pygora from Terry of Rainbow Yarns Northwest. It’s as soft as a very soft thing (I’ve only spotted about 5 guard hairs in a handful of soft) and it has this amazing sheen. Think mohair x cashmere. I hope I can do it justice. 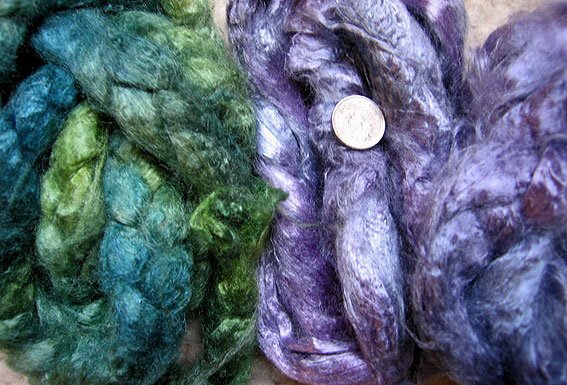 And the 2009 Rampton Project means I’m going to do some more dyeing. I need silk noil to card into my blends… there’s another post. I can boast, er, talk about colour blending on hand cards. I was talking with friends last week about the sorrows and pleasures of growing old, and the speed with which days, weeks, even months just fly past in a flurry of notes about stuff you should have done. One commented that she thought time moved more quickly in part because often we’re repeating experiences or applying knowledge from previous experience: we don’t have to spend time concentrating as we learn new stuff. I raised an eyebrow, grinned, and pointed out that I have at least one lifetime’s-worth of new stuff to learn about spinning before I die. And there’s the dyeing, and weaving, and the history of all these crafts. My teeth are bared in a grin of ferocious pleasure as I contemplate the vast amount of stuff I have yet to learn. On the long, long list: how to get really deep intense colours on silk. These are my best results so far. This entry was posted in Uncategorized on January 19, 2009 by sarahw. Oh, my, that orangey 3-ply is gorgeous. Lovely! And the silk looks scrumptious.RE: Deep colors, presoak longer, post-soak longer. Especially the presoak.